with Quick Charge 3.0 Port, your battery can go from zero to 100% 4X faster than standard chargers. Its convenient size lets you easily store it in your glove compartment or your laptop bag for easy transportation. Compatible with all USB-powered devices including Android & Apple smartphones & tablets, GPS units, iPods, MP3 players digital camera and more. Built-in safeguards protect your devices against excessive current, overheating, and overcharging. CE, RoHS Certified. Equipped with two USB ports, it allows you to charge up to two USB-ready devices at the same time. QC 3.0 fast charge technology features three charging voltage 5V/9V/12V, charging power up to 18W. 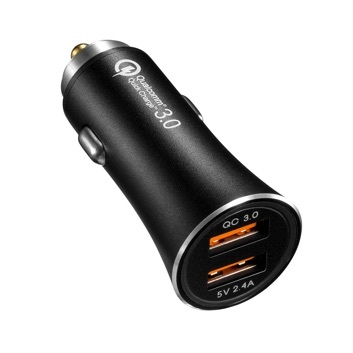 Ultra-compact and slim car charger stay out of the way with two powerful USB charging ports. 30W 2-port USB car charger applied to most of the automobiles on the market, suitable with a variety of car cigarette lighters, 12~24V input voltage for phones, tablets & more. The YI car charger is built to prevent product failures including overheating and short-circuits, ensuring the safety and protection of your charger and devices. If your product fails to work due to a quality issue 90 days after you received, please contact the customer service first. We will replace or repair the defective unit after we confirm the product's problem. But buyer should pay for the shipping fees. *Contact the store customer service directly by sending a message with your order number.